The 500 nm Super Mac which is a race run along side the Chicago Mac only happens every 5-10 years, had a 31 boat fleet with some seriously quick maxis, a Volvo 70, two TP52’s, an STP65, an Andrews 77, a J/V 66 and an ORMA 60 Tri. Here’s our story. Our boat is Hope, a very nice 33 cruzer built in Sweden ten years ago, and owned by Michael Leland an orthopedic surgeon who recently performed his 1000th anterior hip replacement. His original plan to only cruze the boat took a dive when he decided he wanted to win the Chicago Mac cruising division. The first year got him a 4th place flag which fueled his desire to win it. He recruited Vik “Big Toe” to manage the boat, he has a motor sport background and has been part of teams which have won in F1, Indy car and prototype sports cars. He brought on board Mike “Moose” DeBone a free spirit master carpenter as bowman, navigator, helm. Add Fred “Trimming Fool” Bell who is one the best big boat trimmers, as core crew. With the help of Jack who is no longer sailing, they went on a tear, winning local PHRF races and port to ports as prep for the 2011 cruzing Mac which they won. A word about the Cruising Mac, which pretty much every racing sailor here dismisses as not really racing. It is the the fastest growing fleet in the Chicago Mac, and while there are some casual boats, it’s more competitive than you might think. Hope has a 4th, two 3rds and two 1sts. In 2014 Hope won Cruising 2 and beat out a 50 boat fleet to win Cruising Overall, and Michael decided he should stop racing and concentrate on prep for his long term plan to cross the Atlantic. Vik, Moose and Fred started to look for another boat they could help up it’s game. 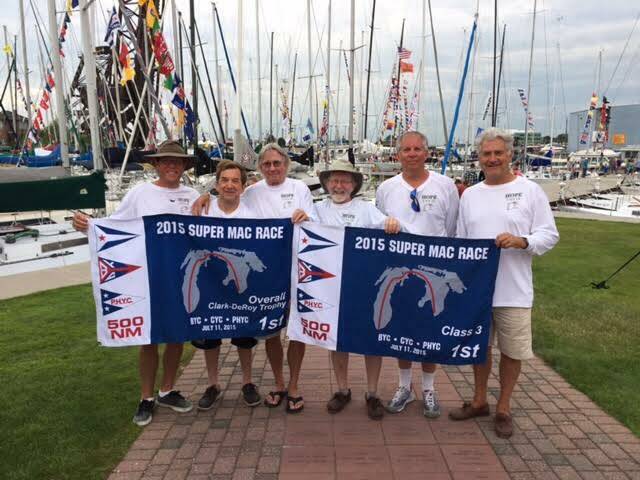 A week before they signed up on another boat, CYC, BYC & PHYC announced they would run a ’15 Super Mac. The core crew had a meet with Michael and they decided to try and win it. It became the Hope final Farewell FO tour. With regular Mac crew additions of Dave ‘BK’ Nielsen and “Joe Frogger” CJ, they came to the start of the ChiMac/Super Mac, they got a first row start and had a weather plan for Rhumbline all the way to Port Huron. We followed our plan, hit a couple of hitches with a 2 hour park up near Racine the first night and a more painful 4 hour layover north of Big Sable which put a damper on winning the Chicago Mac. Hope never gives up, so we redoubled our efforts to do well on the Super Mac, the tracker showed the big boats slowing down and our weather prediction told us to expect some big air on Lake Huron. We crossed the Mac finish line in 6th place (7th in the 129 boat Mackinac Cup division – maybe an omen of things to come for smaller boats), disappointed but happy to see the ringer Detroit boat with the crazy rating didn’t win. A slow 5kt beat around Bois Blanc Island in the rain started our move into Lake Huron but the breeze steadily built and went left until we had enough to bring up our game changer favourite ‘magic white’ A2 North sail. Michael has been a faithful North customer for 20 years so Perry and his staff really take care of our sail inventory, we carried this for many hours until God took it away from us. We quickly got the remains down and went to our 2nd favourite new A2, but were soon advised with a big round up and many semi ‘death rolls’ that this was His last warning. Now with the #3 and reefed main we had 24 hours of great wind that led to 12 hours with some surfing on 6-9ft waves with the odd 12 footer just to keep things interesting and sustained winds of 25 with 35kt gusts (before Clean calls me a liar again, the Coast Guard issued hourly bulletins of SCA and extreme conditions). We now had an inkling that we could do well in fleet, Michael drove us to the finish, surfing into the St Clair river, crossing the finish line at 5am where the welcoming voice of the race committee recorded our time. Our elapsed time of 88:56:07 gave us 1st in class and 1st in fleet. It was a race that had everything, big air, light air, no air, rain, cold nights and hot days, merciless flies at times, but it’s one that will remain in our minds forever. It was perfect weather for Hope ‘the little boat that could’ with six good friends on board to do the impossible and beat up on the big boats. Oddly the big boat rock stars didn’t show up for the PHYC awards-but after party was great fun and well attended by most of the boats that did the race. 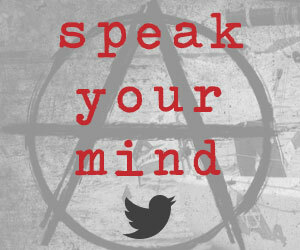 – Anarchist Vic.